Where to find Lakefield hotels near an airport? Where can I find hotels in Lakefield that are near tourist attractions? If you choose to book accommodation near the middle of Lakefield, there are a limited number of options. Central Lakefield has 3 Expedia-listed accommodations within 0.1 kilometres (0.06 miles). If you would like to book a hotel that is not far from the middle of Lakefield, the The Village Inn could be an excellent place to check out. 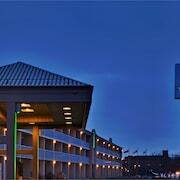 The Holiday Inn Peterborough-Waterfront, ON is located 18 kilometres (11 miles) away from downtown Lakefield. Another hotel is the Best Western Plus Otonabee Inn, which can be found 19 kilometres (12 miles) away. 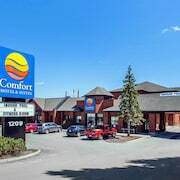 Another option is to book a room at the Comfort Hotel & Suites or the Peterborough Inn & Suites Hotel. Why don't you enjoy the other sites of Southern Ontario while you are here? Southern Ontario is marked by beaches. Commonly visited Southern Ontario visitor attractions are traditional villages. Common activities in this part of Canada include skiing and cross-country skiing. 55 kilometres (35 miles) away from Lakefield is Cobourg, where you can enjoy Northumberland Mall and Victoria Hall. 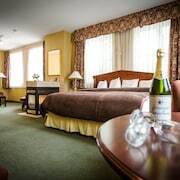 If you'd like to spend a night or two in Cobourg, be sure to check out the The Woodlawn Inn and Best Western Plus Cobourg Inn & Convention Centre. 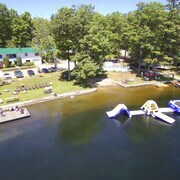 Or stay in Lindsay, 40 kilometres (25 miles) to the west of Lakefield, where you can choose from the Admiral Inn & Conference Centre and Howard Johnson Lindsay. The Ken Reid Conservation Area and Academy Theatre are a couple of the more popular points of interest to check out for those visiting Lindsay. Before you leave Peterborough, make sure you catch some sport. Visit General Motors Centre to the southwest of Lakefield. 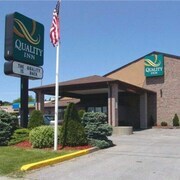 For tourists who are keen on staying close by, make a reservation in the Quality Suites Whitby or Comfort Inn Oshawa. Norman Rogers Airport is situated 140 kilometres (85 miles) from Lakefield. Should you choose to stay nearby, you can book a night at the Travelodge Kingston LaSalle Hotel or the Bayside Inn & Waterfront Suites. 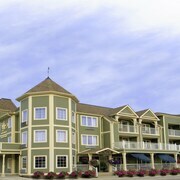 What are the most popular Lakefield hotels? Are there hotels in other cities near Lakefield? 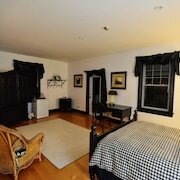 What other types of accommodations are available in Lakefield? Explore Lakefield with Expedia.ca’s Travel Guides to find the best flights, cars, holiday packages and more!